Want Perfectly Soft, Fresh Skin in 2015? This little device by Braun has got to be one of the best beauty tools I've used to date, and I've had my fair share of beauty gadgets over the years! Braun have managed to create something that performs two completely different functions but with no compromise to either, so you genuinely are getting two separate tools for the price of one. I've only been using this for a couple of weeks but can't ever see myself being without it now- who knew that a bit of hair removal and a deep cleanse could leave your skin feeling quite so silky?! Inside the box you get the base product with epilator (hair removal) attachment and a cleansing brush attachment which no doubt you'll be familar with if you own, or have ever lusted over the Clarasonic. As a bonus you even get a lighted mirror and a really good quality pouch to keep all of the bits together! The first attachment is the epilator, I'd never used one of these before but I'd describe it as kind of like very fast mechanical tweezers. The head spins and when held close to the skin it pulls out hair from the root (if you watch the video at the end of this post you'll be able to see much better than I can explain it!) Because it can remove hairs as small as 0.5mm it's great for getting rid of those fine blonde ones that you can see in certain light (and if you think you don't have these, get a magnifying mirror in daylight and look again!) I'm not gonna lie this isn't the most pleasant experience, it's an absolute killer on some areas of the face and makes your eyes water- but if you can name me a hair removal method that's pleasant I'll show you my baby unicorn. It's no more painful than waxing, and way better than stinky hair removal cream which has a tendency to cause chemical burns if you leave it on a second too long. I especially like this for removing all of the fine hairs around my eyebrows, with 200 plucking movements per second it's done really quickly and leaves them looking so much more polished. The results last for up to four weeks, and so if you just grin and bear it it's over before you know it and you don't have to worry about doing it again for ages. 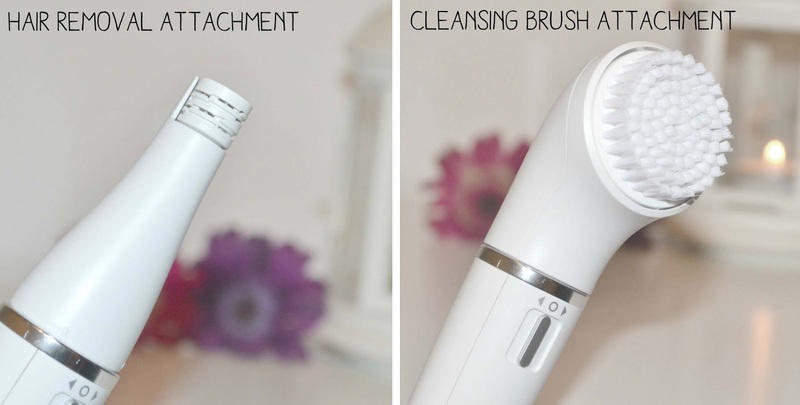 The second attachment is the cleansing brush, I've never owned one of these and so was really looking forward to trying it out. Changing the heads is easy, you simply pull off one and pop on the other. The head oscillates which is said to remove makeup and impurities, and the general gunk that's lurking in pores- and let me tell you I was amazed by this. It was pulling makeup off my face long after I thought it was clean, it just goes to show that a regular double cleanse probably isn't enough if you wear makeup most days. It leaves your face feeling beautifully fresh, and apparently leaves it up to six times cleaner than manually washing. It's gentle enough for everyday use, and as it's waterproof it's quick and easy to do while you're in the bath or shower- just squeeze a bit of your favourite cleanser onto the brush head. Since using this all of my products seem to absorb much more nicely, and base makeup applies much better to perfectly soft and smooth skin too. If you're going to treat yourself to one new beauty tool for the new year, I 100% think it should be this! Does this sound like something you'd use? The cleaning part of this sounds AMAZING and I need to have one in my life. I use an epilator on my legs and have no problem with that, but my face? I am just not that brave. I'd definitely give this a go. Bit expensive right now though :( I'm the same, I can tolerate epilating on my face, although the top lip is a killer, but legs I just can't do!! these spam comments are being removed, so stop wasting your time.